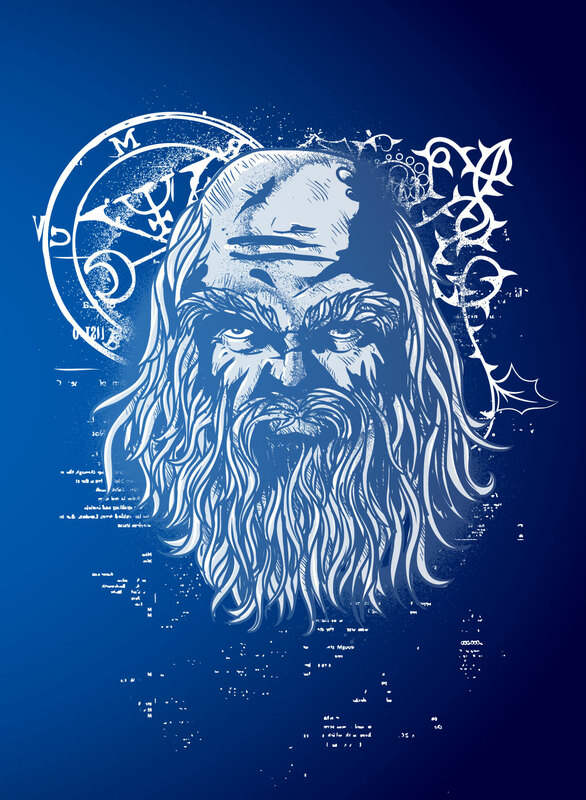 Wizard vector illustration of a grim looking old man with beard, mystical sign and tribal composition. Cool magician vector image to create sorcerer, illusionist, mentor, warlock or medieval scientist graphics. Magicians are popular figures in literature, myths, folk tales, movies and computer games. Cool vector graphics for your magic and fantasy themes. A fantasy world vector image of an old man set on a blue gradient background with grunge texture. Ready to go for a poster, wallpaper, t-shirt or collage center piece. Add this illustration to your collection of fantasy, mystic and magical graphics. Tags: Beard, Games, Gaming, Illusionist, Man, Medieval, Movies, Myths, Scientist, Sorcerer.